Ailsa Frank Wellbeing Ltd Newsroom | Has a heartbreak or loss left you feeling broken? Is it time to break the habit of hurting over the loss of a loved one or an ex? 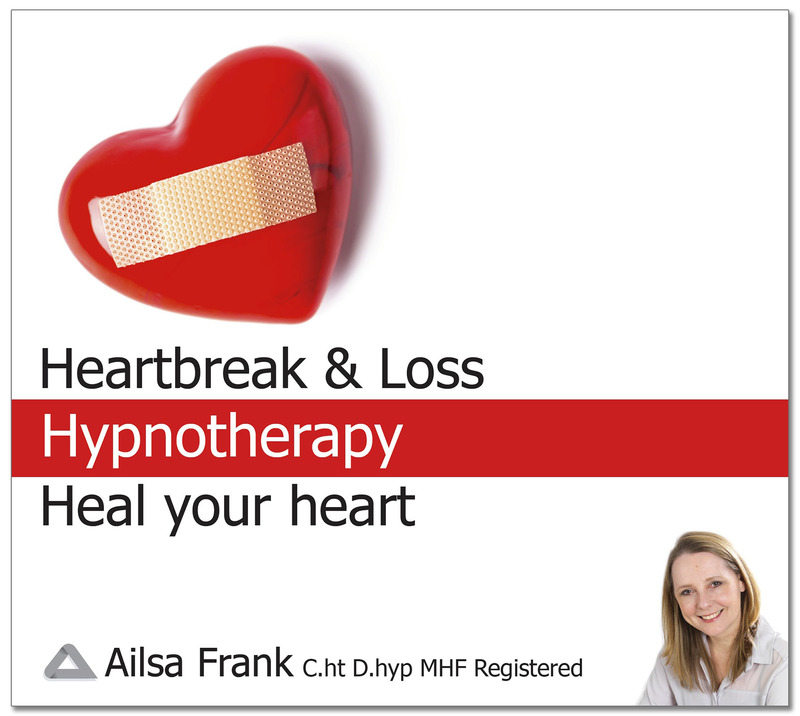 Hypnotherapist Ailsa Frank helps clients to take back control of their feelings following a heartbreak or bereavement. People's lives can be shattered after a loss leaving them unable to sleep, eat or work and they can suffer from physical heart pains too. Hypnotherapy offers a quick way to shift your state of mind and create physical relaxation to get you back on track. Ailsa has worked with many clients in one to one sessions since 2005, but now this Heartbreak and Loss hypnosis download is available for you to buy, bringing the help you need into the privacy of your own home. Lie back and listen as you allow her soothing voice to soften the pain and overlay a new perspective on the situation. A loss is a natural part of life but it often triggers people to fall into an emotional turmoil. You can't change the situation but with hypnotherapy, you can change the way you feel about the situation. People sometimes become anxious, stressed, depressed, drink too much alcohol, lose confidence or turn to food comforts as a result of a loss or betrayal. These recordings will set you on a comfortable healthy path. Research shows broken heart syndrome causes long-lasting heart damage according to the British Heart Foundation. It is important to get support to avoid long-term damage. A condition once thought to temporarily cause heart failure in people who experience severe stress might actually cause longer-lasting damage to the heart muscle. Takotsubo syndrome, also called “broken heart syndrome” can be triggered when a person suffers severe emotional stress, such as after bereavement or break-up. It is thought to affect around 3,000 people in the UK each year. Takotsubo syndrome is a sudden and acute form of heart failure and symptoms can be similar to a heart attack. 1. Try to live each day to the full doing new things because the person you have lost is not here. For instance, learn a new skill, join a class or plan a special trip. 2. Celebrate every day with a colourful paper napkin at mealtimes so you don't slip into depression and remind yourself to enjoy the moment. 3. Remember we are passing through life all of the time. Imagine your life is flowing easily like water trickling down a stream. Go with the flow instead of feeling stuck. This exercise will help you to move forward with a sense of purpose and see the future as an adventure. Testimonial: "After listening to the Heartbreak and Loss hypnosis recordings I am feeling a shift towards my ex, such a relief, peace in my heart and sleeping well." Also recommended is the book Cut the Crap and Feel Amazing by Ailsa Frank (published by Hay House £10.99) which includes a chapter on Heartbreak and Loss issues. Hypnosis works by clearing the unhealthy clutter in the subconscious mind allowing the listener to form beneficial habits so that they can manage their life by making the right decisions with confidence. Ailsa Frank is a hypnotherapist; motivational keynote speaker and author of Cut the Crap and Feel Amazing published by Hay House. Through workshops, one-to-one therapy, her range of hypnosis downloads and book, she has already helped thousands of people to improve their lives. She works with an array of topics including alcohol, stress, relationships, anxiety, depression, confidence and business success. Before qualifying as a hypnotherapist, Ailsa worked as a food stylist and recipe writer for eighteen years. Her journey into hypnotherapy came as a direct result of being so impressed by the effectiveness. Ailsa's own life fell apart during a divorce in 2002, when she lost custody of her 10-year-old daughter following a mental breakdown. In 2005, Ailsa retrained as a hypnotherapist allowing her to help other people build a positive life. Ailsa’s work is featured regularly in the British press including The Telegraph, Daily Mail, Daily Express, The Sun, Marie Claire, Woman's Own, Woman's Weekly, Bella, Top Sante. She has also written articles for publications such as the Mail on Sunday You magazine, Kindred Spirit, Spirit and Destiny, Healthy Food Guide, and Health Magazine. Ailsa is a registered member of the National Guild of Hypnotists USA, General Hypnotherapy Register, The Hypnotherapy Society UK. www.ailsafrank.com Please provide a link to the website if you use quotes or content from this press release.